Architectural plans created using AUTOCAD generally present output drawing file in DWG format. Though useful for its 3D properties, using DWG files can be troublesome if you’re creating an interactive presentation. This is because accessing DWG format files require specific viewers or AUTOCAD application. Downloading and installing these tools takes a huge amount of your precious time. Well, in this situation converting DWG files into image format using an effective conversion application comes out to be a plausible solution. 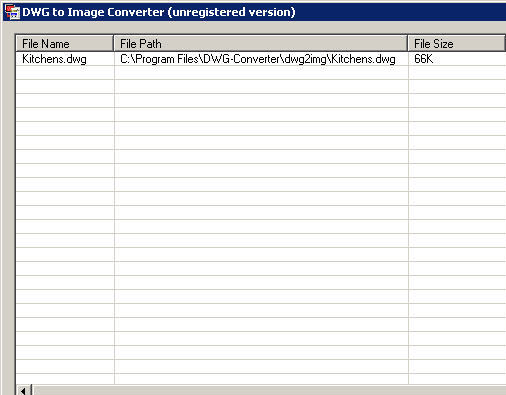 If you’re also seeking a similar tool then you can try DWG to Image Converter 2.00. The utility is capable of batch converting your DWG files into JPG, TIFF, PS, PNG, BMP or EPS format image files. It’s capable of working with DWG files created with AutoCAD applications from version R2.5 to version 2008. For using the DWG to Image Converter 2.00 you don’t require AUTOCAD installed on your system. The utility functions proficiently thus preventing the hassles of re-edited or re-formatting the image files. While converting the DWG files, it’s capable of retaining original DWG file’s layout. Talking about the functioning part, first step is the selection of DWF files, which afterwards are queued up at program’s main screen. The selected files in the list are displayed with File Name, File Path, File Size, and Status details. If you do not wish to make any changes to the program’s default settings, then ‘Convert’ and the chosen files would be converted into image files. However, if you wish to derive the output image files with desired attributes then press ‘Option’ button to access the configurations. These includes feature allowing you to set the output folder, along with output image format to be JPEG, TIFF, PCX, BMP PNG, ES, or EPS. Along with the image formats you can even customize their properties to get even specific result. DWG to Image Converter 2.00 facilitates you in batch converting your DWG files into quality image format files for variety of purposes. The utility gains 3.5 rating points on the basis of its prompt functioning and neatly framed features that help you to configure the conversion process as per your suitability. Converting AutoCAD DWG documents into JPG JPEG PNG TIFF BMP EPS PS normal files couldn't be any easier. Simply open the DWG file you want to convert into Image file and click the "Convert" button in the dialog, DWG to Image Converter quickly re-creates your DWG file as a fully formatted Image files. Get the job done in seconds or minutes, not hours or days. DWG to Image Converter eliminates the need to re-edit and re-format Image documents, saving you both time and money. You will be amazed at the results you get from DWG to Image Converter. It accurately retains the layout of the original DWG file.